FORT MYERS, Fla. – The signs are everywhere this Thursday night in Alico Arena. Florida Gulf Coast plays host to Lipscomb, a key conference game to get the Eagles back on track after an up-and-down stretch. But pause from the action to take a look at all Dunk City has wrought. There’s the crowd for one, which has bloomed during the past two years. These fans sway side to side as Dunk City, a remix to rapper Tyga’s Rack City, blares through the speakers. The students at the ends of the arena rock with reckless abandon. The guarded, graying season-ticket holders follow in tune with equal enthusiasm. And the words “Dunk City” scream out: graphics on the walls, marketing on the facades, banners draped from rafters. There are shirts sold by vendors, shirts worn by fans, shirts players adorn on the sideline. Free shirts are even tossed into the stands by cheerleaders. Like a restaurant, entry requires a shirt. Later, when the game gets going, more “Dunk City” appears, this time on small paper signs distributed to and waved by fans. A glance at the court confirms it: Yes, this is Dunk City. There’s Brett Comer and Bernard Thompson, two of the key catalysts to this whole thing. The guard duo has combined for more than 3,000 points and 1,000 assists in almost 8,000 minutes. They comprise one of the most prolific backcourts in college basketball. You may see them as they were two years ago, though. Comer, the punky point guard with sick passes. Thompson, the stoic sidekick with a sweet shot. If that were not enough, the rafters reveal what you must already know. Indeed, this is the team who made NCAA history two years ago as the only No. 15 seed in history to reach the Sweet Sixteen. FGCU knocked off Georgetown, whipped San Diego State and then fell to Florida. FGCU was a true Cinderella, but a rap-rock version. No glass heels, no pretty dress -- just dunks and a defiant attitude. • New shirts with #WingsUp on the sleeves instead of #DunkCity. • A new style of play has emerged -- more structured, traditional and without as many dunks. • Sherwood Brown, he of the dreadlocks and Dunk City’s former leader, now is a Maine Red Claw in the NBA Developmental League. • Chase Fieler, a good-mannered West Virginia boy who slammed many a dunk, now lives and plays in Spain. • And, of course, the mayor of Dunk City, Andy Enfield, now coaches Southern Cal. Hold your gaze long enough and past, present and future will blend for brief moments. Jamail Jones, a transfer who was a redshirt during the 2012-13 “Dunk City” run, slams down an in-bounds pass from Brett Comer. Later, Comer tosses a half-court pass to Julian DeBose, who transferred the year after “Dunk City;” he finishes at the rim. The crowd stirs. With FGCU's win in hand, most people in the arena focus on the exits. The player who most represents the still-beating heart of “Dunk City” sits on the bench, a towel over his head that rests in his hands. The towel drops and Comer has a puffy face and red eyes. Today marks five years since his father died. It is the first time Comer has played a game on this date, besides the day itself. He admits winning does not mean as much without the people around him. When Comer and Bernard Thompson graduate this year, few traces of “Dunk City” will remain. The FGCU athletics department is 13 years old, and has been an NCAA Division I program for eight years. FGCU built the program. FGCU battled for recognition. Florida Gulf Coast University now must sustain its success. So the question is: If you build it, how long might it last? The Florida Gulf Coast University story begins not with dunks or fathers or legacies, but a swamp. A swamp with Melaleuca trees and alligators and water moccasins and armadillos. All that and the son of the man who helped foster Florida’s more iconic Swamp. Ben Hill Griffin Jr. donated more than $20 million to the University of Florida and its athletics program. His name now adorns the Gators’ football stadium. Griffin Jr. passed away in 1990. 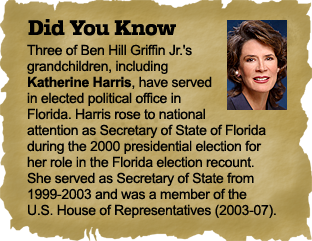 His son, Ben Hill Griffin III, became CEO of the family business, Alico Inc. The company’s headquarters are in Fort Myers, Florida, and Griffin III got wind that a group had plans to build a university in Southwest Florida. 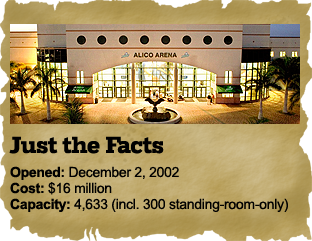 He gifted the funding and the 760 acres that in 1993 became the site of Florida Gulf Coast University. Following four years of construction, the school opened in 1997. 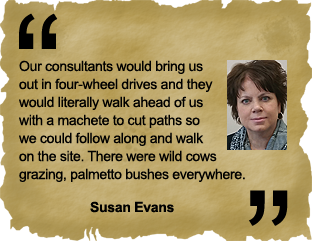 “You don’t really think that you can be a pioneer at this late development in our century,” Susan Evans says. She is one of FGCU’s Founding Five, the group which initiated the university’s start. Evans now serves as chief of staff and university spokesperson. The swamp with the lethal animals came into play in 2001. Beside the marsh were leaky trailers that served as the home of the Eagles' athletics program. FGCU competed for one year at the NAIA level -- and it was in only four sports: men’s and women’s tennis and men’s and women’s golf. Under the direction of new president Bill Merwin, FGCU wanted to expand athletics and compete in NCAA Division II. For that, it needed an arena and fields, but what it had was a swamp. With a $5 million gift from Ben Hill Griffin III and fund-raising within the community, FGCU was able to buttress the site. While Alico Arena was under construction, the FGCU men’s basketball team held its practices at community colleges or in high school gyms. The team, made up of local kids and DI transfers, practiced wherever they could find court time. 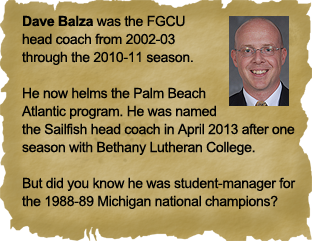 Leading this traveling show was head coach Dave Balzo, the man entrusted to lead FGCU to DII success. And times were tough. The Eagles’ first Midnight Madness intended to serve as an unveiling for the new arena, but a storm scared away would-be attendees. As a way of christening the arena, the team slept in the President’s Box that night -- but also because it had practice at 6 a.m. When FGCU started going on the road for games, the team often would stop twice at the same McDonald's, saving money where it could. “We were lucky if we got to go to Golden Corral,” remembers FGCU Associate Athletic Director Mike Estes, who in those days was an athletic training coordinator. 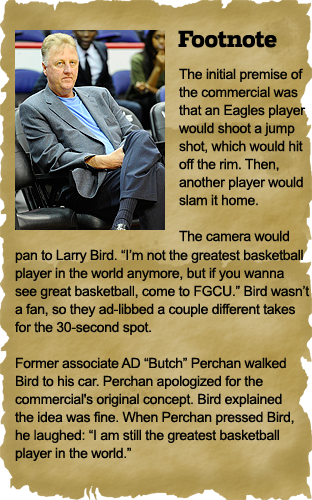 All that time, as FGCU was developing, Larry Bird was watching. Yes, that Larry Bird -- Larry Legend. Following his retirement, Bird owned a house among other property in Naples, Florida. He appreciated the Indiana connections within the school and athletics department. So when FGCU asked Bird to film a commercial for its inaugural season to raise its profile, he agreed. Bird became somewhat of a fixture at games, and he graciously autographed memorabilia for fans and provided local notoriety to the nascent program. But none of that helped FGCU’s bigger problem: No DII conference wanted the Eagles. Without a conference, few independents qualify for the NCAA postseason at any level. Attempts to join the Sunshine State Conference failed. The all-private school conference was hesitant; the state school already had exceeded early expectations. When the Atlantic Sun Conference welcomed FGCU, the school was eager to finally find proper footing. But there was one issue: The A-Sun is an NCAA Division I conference. What choice did FGCU have, though? The administration decided to jump into the bigger pond it never planned on joining. The Eagles struggled, going 19-41 in two NCAA "transition" years, including mandatory postseason ineligibility. After the second season, the program parted ways with Balza. The search was on for a new men's basketball coach. Name-brand coaches like Rick Pitino and Clifford Ray made the finalists’ pool. But FGCU did not end up hiring a coach. What it hired was a city architect. 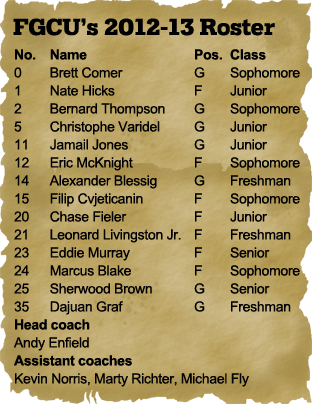 His name: Andy Enfield. Chase Fieler just wanted more fans to crowd the court and watch them play. That and some free food before games. At most universities, school spirit and fans and boosters just are. All something newcomers enter into and evolve. At FGCU, it was another thing they had to start from scratch. So Fieler approached Denise Da Silviera, head of marketing, with a request: He wanted to join FGCU’s incipient student fan group, the Dirty Birds. Fieler had his $10 fee in hand and thought that with an athlete's involvement the group could grow into something special – and he wanted to help. A friend of Fieler’s used to drive around campus, delivering free pizzas to students and shouting game announcements through a megaphone to drum up excitement and interest. Fieler would hop in, riding by dorms, screaming and smiling. Fieler wasn’t the only one to help. Brett Comer and Bernard Thompson slipped fliers under dorm-room doors. They wrote on whiteboards, reminding students of games. Sherwood Brown was a virtual fixture on the grounds those days. When he was not at practice he was on campus, talking to students about whatever, whenever. FGCU often would play doubleheaders, with the women’s game first. Before the women tipped off, a decent crowd would be on hand -- 2,000 to 3,000 depending on the opponent. Under head coach Karl Smesko, FGCU’s women have enjoyed consistent success and a core following. (Larry Bird enjoyed watching FGCU’s women play because they reminded him of old Indiana-style basketball.) When the women would finish, about half the crowd would trickle down from the stands. The men’s team watched the exodus during warm-ups. They convinced themselves the fans were getting concessions or needed a bathroom break. The fans, they believed, would return. They never did. “When we first took the job, you could feel the lack of pride and almost a sense of embarrassment in that they felt like second-class citizens,” assistant coach Michael Fly recalls. Fly had been part of Florida State’s staff and joined Andy Enfield when he left FSU to become Florida Gulf Coast’s head coach. So they practiced, they played, they perfected. It takes athleticism to play in Andy Enfield’s system: a baiting, matchup-switching defense that transitions. The Eagles had athleticism. What they did not have was stamina. • Sherwood Brown was not recruited out of high school. He was a walk-on under head coach Dave Balza. The coaches realized Brown's talent and he received a scholarship. • Chase Fieler played high school at little-known Parkersburg South in West Virginia. As it happened, two of FGCU’s players went to the same high school. They alerted Balza to look at Fieler, who then received an offer. • Marty Richter briefly fell out of coaching, and covered basketball recruiting for ESPN. Richter’s wife, Brenda, took a job at Florida State and Richter began spending his free time at FSU’s practices. He befriended Andy Enfield, an assistant coach, and Michael Fly, FSU’s video coordinator. Florida State advanced to the Sweet Sixteen in 2010 and Enfield took the job at FGCU and brought Fly and Richter with him. • Austin Rivers overshadowed Brett Comer at Winter Park High School, where they won back-to-back state championships. Comer signed a letter of intent with FAU, but his father's death forced Comer to reconsider his path. He wished to be closer to family at that time. Enfield approached Comer and told him wanted to make Comer FGCU’s point guard for the next four years. Comer and Eric McKnight visited campus and both signed. • It was a similar deal for Bernard Thompson, who played with Kevin Ware at Rockdale County in metro Atlanta. When Enfield visited Rockdale, he convinced other teams to look closer at Ware if they wanted a chance of winning. Enfield, who knew Thompson had a baseball game that night, saved his pitch for then. It worked and Thompson signed a week after Comer. • When the coaching staff arrived on FGCU's campus, Enfield quizzed then-team trainer Mike Estes. Enfield wondered if there were any diamonds in the rough. Estes told Enfield of Eddie Murray, who he insisted can “jump out of the gym.” Enfield, a bit doubtful, reminded Estes of Murray’s 3.0 ppg and 1.6 rpg averages from the previous season. Enfield watched Murray the first day of practice. His response to Estes is not fit for print. In 2011, FGCU overachieved in its first year of NCAA postseason eligibility. The Eagles advanced to the Atlantic Sun championship game but lost to Belmont. A win would have propelled FGCU into March Madness. Alas, it wasn’t meant to be. An offseason tournament in the Bahamas and tough stretch to open the 2012-13 season, including a win against Miami (Fla.), taught this new bunch something: It had a chance to be something special. Coaches and players thought they deserved higher than the No. 15 seed after winning the Atlantic Sun tournament. Yet the Eagles were eager to face Georgetown. FGCU knew it had a tactical advantage if the Eagles could force the Hoyas to play their style of game. You know this part of the story, how it all fell into place for FGCU. The dunks. The flippant attitude that captured the imagination of the nation. Brown, who dapped up TNT’s announcing crew with the game in progress. Enfield's proclamation: “We’re going to win this game and go to the Sweet Sixteen.” And how that’s exactly what happened when FGCU smashed San Diego State in the next game. Estes sent out Brown and Fieler as quasi-sacrifices. The team needed to part the sea of fans so the team could return to the promised land of campus. But an even larger group awaited, anticipating a glimpse or, if they were lucky, some attention from their new heroes. And that’s what they got. “I’ll be honest with you, it was like our guys were rock stars,” Richter says. Athletes love routine and structure; it helps them prepare and process. So FGCU’s players tried to follow a normal routine. Tried. ... Wherever they went, a mob tagged behind or around or ahead. Nothing was normal about that week. A student asked a team manager to sign his face. A group of players who usually ate lunch on campus before practice made it past the dining hall doors. They were swarmed and had to traverse back to the gym, escorted by campus police (and with empty stomachs). Once inside the gym, the Eagles practiced and the doors opened to a mass of waiting reporters. Wherever a coach, player or administrator was requested, they went to different stations around the arena. Good Morning America. ESPN. USA TODAY. New York Times. Yahoo! The Today Show. Some tried to deny it, but the week overwhelmed the Eagles. That much attention, from that many people, on that type of stage is bound to have an effect on the psyche. Just imagine how it was for a team tasting it for the first time. FGCU battled Florida in the Sweet Sixteen; the Eagles led for much of the first 10 minutes. Two Michael Frazier II 3’s -- right in front of FGCU’s bench -- gave the Gators a lead they never relinquished. The game played out with little remaining drama, as did FGCU’s improbable run. It was a Cinderella story cast asunder. Happy endings are an illusion -- a moment of glory frozen in place that happens to conclude a story. Reality, the perpetual bully, does not end. Time beats on. Coaches leave. Players graduate. Hype fades. The present, that used to be so full and glowing, transforms into a memory for most. But can a feeling, an idea, a connection -- can it ever die? Sometimes, watching Brett Comer play point guard, you wonder what the hell he’s doing. He drives deep in a defense and allows himself to get trapped. Or he leaves his feet with what may seem like no options. But then he dishes the ball nanoseconds before real trouble escalates. With reckless abandon, he produces surefire points. Teammate must prepare for anything because the ball may hit your hands without warning. Like the best, he will predict where you will be, not where you are. Early in his career, some fear, some hesitation may have crept up, causing turnovers on the court. 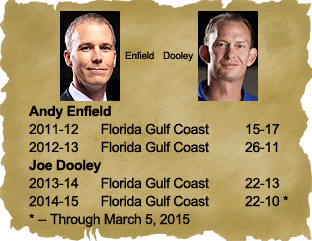 Now, under head coach Joe Dooley’s more structured system, most of that has dissipated. Comer may not play with fear anymore, but almost every other emotion is on display when Comer is on the court. If he’s feeling it and nails a shot in an opponent’s face, Comer will let the arena know with a scream or shout. If he sees an advantage, a mischievous half-grin appears as if Comer knows something you do not. Frustrated with a teammate, his body language will scream disappointment though Comer may not utter a word. To opposing fans, Comer is the totem for their vitriol. They make fun of his graying hair. They mock his tattoos, the earring he wears off the court. Failed alley-oop attempts could provide fodder, depending on the game. They choose Comer because he shows those emotions, because he wears his heart on his sleeve. Inside of his sleeve to be exact. Troy Comer was not a basketball fan when he met his wife, Heather, in Orlando, Florida. Heather was. A season-ticket holder for the Orlando Magic, she convinced Troy to join her for a game. They did and Troy fell in love, twice over. Marriage followed as did a son, Brett. They became a tight-knit bunch. They ate dinner together nightly and developed into friends as much as family. The Comers’ central connection was basketball. Once Brett realized his passion for the game, Troy studied, like a father learning algebra to help teach his son. He coached Brett’s AAU teams despite never playing the game. Following a four-year stint in Kansas City for Troy’s work, in 2009 the Comers planned a return to Orlando. Four days before the move, doctors diagnosed Troy with lung cancer. Ten months was all they had with him after that. In the wake of his father’s death, Brett acted fine for a while. More quiet, more to himself maybe, but nothing that worried his family. Heather admits they were trying to protect each other, trying to comfort each other by keeping on. Once at FGCU, Brett talked to Enfield, who realized how much Brett was struggling and advised him to seek grief counseling. Brett rejected the notion, but would later agree. Florida Gulf Coast's Sweet Sixteen appearance symbolized something different for everyone involved. Each person who came to FGCU, top to bottom, was searching for something missing in their lives. A university. A chance to play. A coaching career. For Brett, it was a chance to heal, and share his dad’s story. Talking about his dad helps him as much as the tattoos. Through FGCU, his coaches, his teammates, the team’s accomplishments, Brett became better. “I went from a kid that didn’t know how to deal with everything to kind of a man now,” he admits. Brett plays to reconnect with his dad, and to one day provide for his mother. Brett also plays because that’s where he can most be himself. Within the game is where Brett can display all the emotion he never could. If only his dad could see him now. “He’s grown up so much. His dad would be so proud of him,” Heather says. “That’s another really hard thing because there’s so many times I think ‘Oh my god, Troy, you would be so proud for Brett,’ and I wish I had him there to share with me. Sometimes that’s difficult. “He wouldn’t believe the things Brett has accomplished in basketball,” she adds. If the folks at FGCU are dreamers, think of head coach Joe Dooley as the necessary reality check. He looks every bit the part of a traditional college basketball coach: slicked-back hair; sharp, slightly weathered facial features; prone to wearing plaid sports suits. Players and assistant coaches use "fiery," "aggressive," and "intense" to describe Dooley's on-court nature. It is a total 180 from Andy Enfield’s gregarious nature. Dooley does not view FGCU’s Sweet Sixteen run emblematic of anything outside of itself. 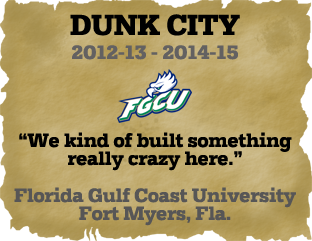 “Dunk City” is only what it has become: a brand. Dooley coached 10 years at Kansas under Bill Self, where KU went to two Final Fours and won the 2008 national championship. A Sweet Sixteen run is what it is -- nothing more. Within FGCU, it’s a burgeoning program with high expectations. Dooley knows a whole different set of expectations. “No disrespect to Florida Gulf Coast, but I think the fan expectations at Kansas were pretty high, too,” Dooley says. As much as FGCU’s story is about dedication in the face of adversity, it’s also about finding the right people at the right time. Andy Enfield was the coach who made FGCU believe in itself when it did not. Dooley is the man preparing to evolve FGCU past “Dunk City” and into a perennial contender. That is the expectation. Dooley rather would not discuss the future as much as the rest. He says comparisons to Gonzaga and other mid-major powers are “inappropriate.” With regard to expectations, Dooley said “everybody’s already ahead of themselves." It required more than a month’s time, but Dooley was proven correct. FGCU battled South Carolina Upstate in the second round of the A-Sun Tournament. Since the Eagles were the No. 2 seed -- and No. 1 North Florida whipped Lipscomb -- it was to be the final “Dunk City” home anyway. It was a back-and-forth affair. SC Upstate forced FGCU to settle for jumpers on offense. FGCU, as Lady Irony smiled, survived on 3-pointers. Thompson hit a few, Comer managed a four-point play, as the Eagles could not get anything inside. Five seconds left, FGCU down, and Thompson took the inbound pass. Upstate tried to foul before Thompson could fire a shot, but he timed it and drew the foul in the act of shooting behind the arc. Three foul shots to tie the game and go to overtime. Make. Timeout by Upstate to ice Thompson. ... Make. All Thompson had to do was repeat the process. ... Clang. It ricocheted off the back of the iron, too much effort from Thompson. The dreams of “Dunk City” were over. Again. Drive onto Florida Gulf Coast’s campus, the entrance now marked by a regal sign. Remnants of old remain, but this story concerns itself with basketball. Double-tap a foot outside Alico Arena to ensure the ground is still not a swamp. Sinking is not in your plans. Walk past the palm-trees lined doors and inside are reminders of FGCU’s short-lived Division II mindset. There are plaques and pictures on walls. There are makeshift offices for administrators, workers, some coaches. Each of them are trying to keep up with the burgeoning expansion. Open the gym doors and there sits the court, site of both practice and games for various sports. Look at the “Dunk City” branding that screams at passersby. Walk past it all, more than a month before FGCU’s season would end, for a talk with Brett Comer and Bernard Thompson. Before that final buzzer against USC Upstate, Tompson and Comer had thought of what the ending might be like. How would they like to be remembered? “The guys who built ‘Dunk City,’ ” Thompson says. “We want it to be like, ‘Remember when Brett Comer and Bernard Thompson went to the Sweet Sixteen.’ They played Florida. They beat Georgetown, beat San Diego State. As much as Brett Comer and Bernard Thompson wanted to hoist FGCU on their shoulders, to prove that "Dunk City" is not yet dead, it was never necessary. The legacy they envisioned when they stepped on campus had already been theirs. Anyone who builds something does so with the hope it will outlive them. “Dunk City” now exists outside of its creators. No one will be on the team with that badge of honor. So the question is not if it will last, but now how will it grow? Likely as it always has: Out of a swamp with plenty of sunshine, collapsing into the future as fast as it can.